I was looking at some of the Stack Overflow noflo questions yesterday, and there were a few related to building NoFlo for the browser. This made me realize we haven’t really talked about the major change we made to browser builds recently: webpack. Originally NoFlo was designed to only run on Node.js — the name itself is a portmanteau for Node.js Flow. But in 2013 we added support for Component.js to package and run NoFlo and its dependencies also on the browser. 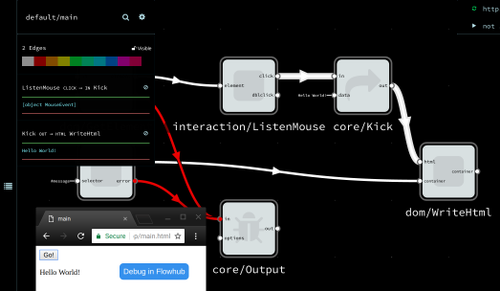 This enabled lots of exciting things to happen: NoFlo example projects people could run simply by opening them in the browser, and building full-fledged client applications like Flowhub in NoFlo. Unfortunately Component.js foundered and was eventually deprecated. Luckily others were picking up the ball — Browserify and webpack were created to fulfill a similar purpose, the latter picking up a lot of momentum. In summer 2016 we jumped on the bandwagon and updated NoFlo’s browser build to webpack. And of course all other benefits of a thriving ecosystem. There are tons of plugins and tutorials out there, and new features and capabilities are added constantly. To automate these steps we have grunt-noflo-browser, a plugin for the Grunt task runner that we use for build automation. Since we’re using NPM packages for distributing NoFlo modules for both Node.js and the browser, it is important to be able to communicate which platforms a component works with. By default, we assume all components and graphs in a module work on both platforms. For many typical NoFlo cases this is true. However, some components may use interfaces that only work on one platform or the other — for example webcam or accelerometer access on the browser, or starting a web server on Node.js. The project contains a fully working build setup, including Travis CI compatible test automation. If you supply Travis CI a GitHub access token, all tagged versions of your app will automatically get published to GitHub Pages. If you want to disable the WebRTC runtime option, simply pass a debug: false option to grunt-noflo-browser. More details for using the template can be found from the project README. In addition to building browser-runnable bundles of NoFlo projects, the grunt-noflo-browser plugin can — despite its name — be also used for building Node.js runnable bundles. While a typical Node.js NoFlo project doesn’t require a build step, bundling everything into a single file has its advantages: it can reduce process start-up time drastically, especially in embedded devices with slow storage. In addition you’ll want to define any native NPM modules as webpack externals. We’re using this setup in production with some Node.js applications, all browser-capable NoFlo modules, as well as the Flowhub web app. If you want to get started, simply fork the noflo-browser-app repo and start drawing graphs! Update: If you don’t want to use Grunt, you can use noflo-component-loader to build a statically configured component loader and then use webpack directly. See NoFlo browser documentation for more information. 17 February 2017 in Berlin, Germany. 5 minute read. This post talks about some useful patterns for dataflow architecture in NoFlo web applications. 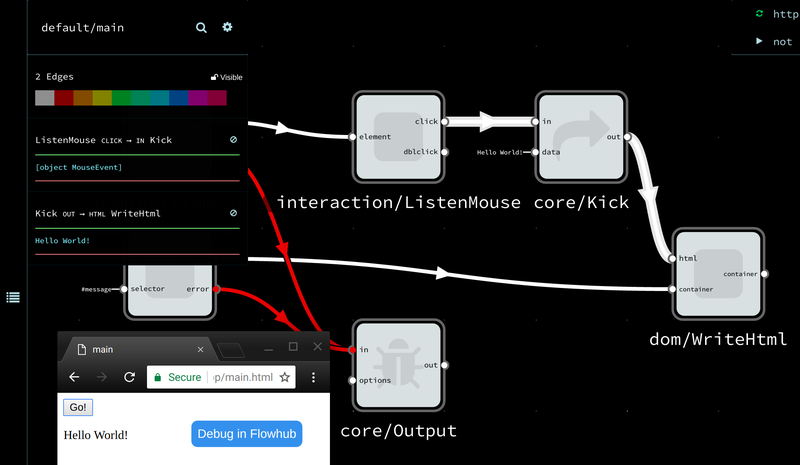 We’re using these concepts to build Flowhub, the flow-based programming IDE. 01 August 2013 in San Francisco, California. 7 minute read. 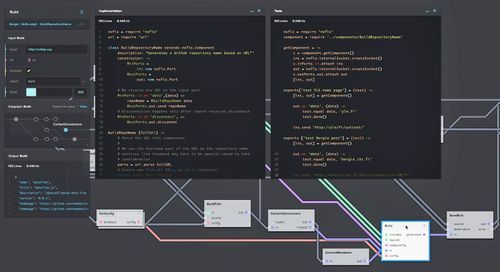 Flow-Based Programming (FBP) is a software development paradigm where applications are built by "wiring together" various reusable components inside a graph. Read more Flow-Based Programming posts.